Lady Wallscourt, steel engraving*) by George H[enry] Phillips after Thomas Lawrence (1769-1830) 1836. Portrait of Elizabeth, Lady Wallscourt (Elizabeth Locke 1806-1877, married to the 3rd Baron of Wallscourt at Ardfry House, Galway, Ireland.) playing the guitar. The steel engraving was printed in several editions of which two are in my collection. The probably earliest of the versions has the following text: "SIR. THOs. LAWRENCE, P.R.A. GEORGE H. PHILLIPS / Lady Wallscourt / Proof / London, Published April 10, 1839, by Hodgson & Graves, Her Majesty's Printsellers, 6, Pall Mall"
The second version in my collections has the following text: "SIR. THOs. LAWRENCE, P.R.A. GEORGE H. PHILLIPS / LADY WALLSCOURT". It is framed and the text of printed label on back of frame: Philip Moore / Pictute [sic] Framer & Gilder / 65, EDGWARE ROAD, / MARBLE ARCH, W. / DEALER IN OLD AND MODERN PICTURE. This print was bought at an antique dealer, Long Melford 1994. 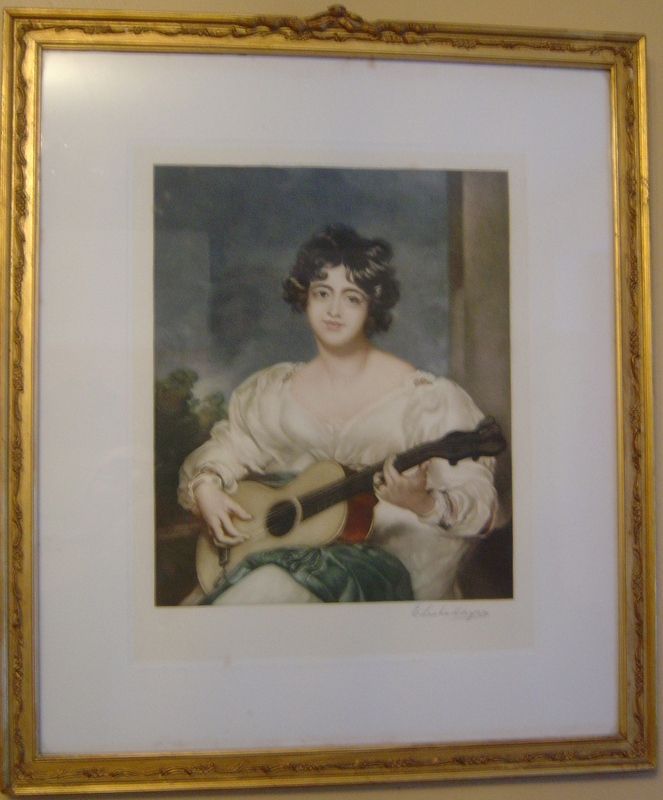 Another coloured print with the same motif was engraved by E. Leslie Haynes (photo James Westbrook) and is in The Guitar Museum. It is clear that Tomas Lawrence painted the original portrait of Elizabeth Wallscourt with a start in June 1825 and quite soon thereafter an engraving after the painting was done. As indicated above the portrait became very popular and the engraving went through several editions. In my collection I have furthermore a short undated autograph letter by Lady Wallscourt with her coat of arms. William Locke and Miss Jennings had three children. The eldest was William, of whom I will presently tell the tragic story, then came Charles, who died in infancy, and Elizabeth. The lovely Elizabeth married an Irish peer, Lord Wallscourt, and their home, Ardfry, in Co. Galway, often welcomed Sir Thomas Lawrence, old friend and honoured guest. I like to think of the great man whiling away the summer days in that wild corner of Ireland, painting the portraits of the beatiful Locke family. Up to a few years ago Ardfry still possessed the portrait of Lady Wallscourt by Lawrence, a lovely vision in white muslin, playing the guitar, her lips half opened in song. There was also a portrait of her young brother William by the same artist... Both these pictures have shared the fate of many others: yhe day came when money was more vital than family possessions, so the lovely singing lady and the "Boy and Dog" crossed the Atlantic and the halls of Ardfry knew them no more. In 1825 she [Elizabeth Wallscourt] sat for Lawrence for her picture. We see her in the full radiance of the famous Locke beauty, with large eyes, wild curls, and parted lips, singing as she plays the guitar, a full white musilin fichu framing her pretty shoulders. Lawrence gave himself a good deal of trouble over this portrait. The sittings were interrupted by Lady Wallscourt’s sickness. “Illness can hardly render her more dear to us all who have the delight of knowing her, but it tells them how dear she is in their remembrance and how peculiarly they esteem her,” wrote Sir Thomas Lawrence to her mother. When finally completed, the picture had an enormous success. It was obviously a gift of the artist to his old friends. Unfortunately the companion picture of young William, which he promised, does not seem to have been painted at all, or at any rate has vanished. “In consequence of our talk and pleasant arrangement the other morning I shall to-day about twelve o’clock take the liberty of sending for the Portrait of Lady Wallscourt. The Frame I shall not want, but if it be inconvenient to you to retain it, the careful porter who goes for the picture, shall bring it in the Frame. “I need not say how careful I shall be that the portrait sustains no damage in the absence from you. It will certainly be returned to you at time I mentioned, and in the next year Room shall be more completely furnished. The whereabouts of the original painting of Lady Wallscourt by Lawrence is not known. One source mention its present location as “Christies, London”. I am indebted to John Nuttall, who has provided much interesting and valuable information. Colonna, Vittoria. Things past. London s.a.
Sermonetta, The Duchess of. The Locks of Norbury. The story of a remarkable family in the XVIIIth and XIXth centuries. London 1940.